Here’s a little Throwback Thursday Action for you! That’s right the F/V Indiana! It had one of the most memorable paint jobs of the fleet. I haven’t seen this boat in southeast in quite a few years. The last memory I have of the boat would be the 2010 season when they broke their boom. I’m pretty sure this boat is still around. Any else got details on this one? You can even see the Aimee O in the background. This shot I’d from 2006! This boat always make me think of this song too! Maybe you’ve heard of it… It’s an oldie, but a goodie. They’ve been in the PWS for the last 3 seasons. Loudest skiff in the fleet, can hear it like 2 miles away. Nice! That explains it! Thanks for all the comments and interest. Make sure to stop by and see the ComFishFilmFest booth 1643 at the expo. I would like to say hi. I’m sure ill see ya at the PuB Trawl, at least that’s what Im calling it. I fished on the “Georgia” back in the 70’s & 80’s and the “Indiana” was one of the “state” boats also, along with Kansas, Vermont, etc. Georgia had the same wheelhouse windows and wheelhouse door, but think the hull was a bit different, Ironically your cover picture of Kona Rose was the last vessel a great old seine boat captain(Myron Petersen aka Peter Rabbitt) who was best friends with Georgias captain ran under the name F/V Chardon Linley. A sad fate fell upon Peter and a few years later she became Kona Rose. Peter also ran Glacier Bay,Dora R and other Whitney Fidalgo boats. Georgia is laying at the bottom of Oak Harbor, Washington, hit a sand bar(early 90’s), and rolled and went to her watery grave(all survived) after 70+ years in the Puget Sound and S.E fleet. And yes, I remember the song! Nice website. Robert (Rocky) Schultz F/V Georgia and Connie Marie -70’s and 80’s. Great info! Nice to connect with you. I live hearing about boat history. I just worked this last season on the Dora R / Quandary. What an incredible summer. The Indiana is out of the water here in Port Townsend and is on blocks right next to the F.V. Genius. 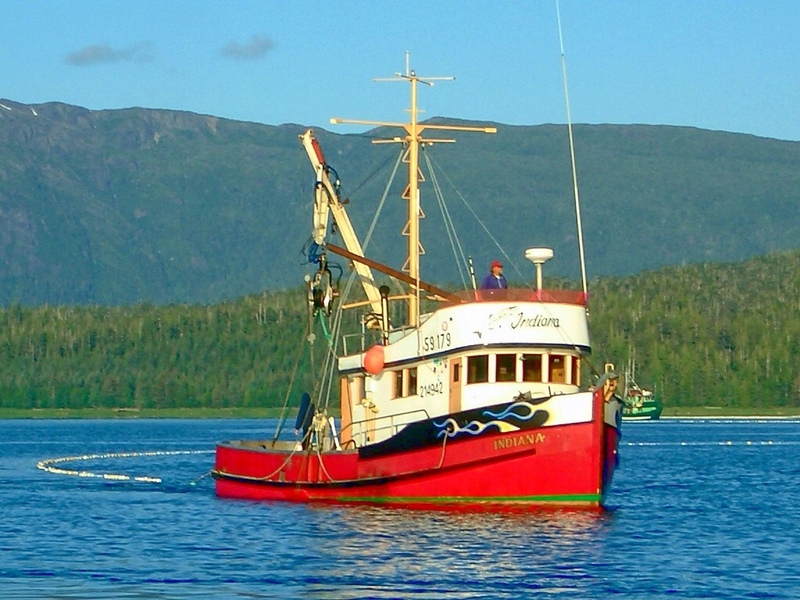 Marty McCallum, the boats captian and owner had a great year on Prince William Sound di he is doing some work on her. Thanks for the info Chris. I’ll be coming to visit you guys sometime after Thanksgiving this year. ComFishFilmFest is blowin up and we need to do some work for http://www.ageniusproject.com. I’ve got photos of Indiana on the hard at PT 2013. Shot some new ones today on the West Wall at Fishermans Terminal Seattle. She’s here getting some Hydraulic work done.